Measurements: 3.15 x 4.75 inches, or 80 x 120 mm. Back of card: Solid light purple with a white border. Printed in thin, lighter light purple lines, the Sun from the Sun card in the upper left corner, and the Moon (upright) from the Moon card, in the lower right corner, with the word, ELEMENT printed in the center between them. Can be inverted if you're not fussy. Book included: Yes, 151 pages, 4.7 x 7.1 inches, or 11.8 x 18 cm. Illustrations are small. Publisher: Element. Printed in the UK. Comments: The back of the box shows tiny illustrations of the complete major arcana cards, along with 6 of the minors. At a glance, this would seem to be another Rider-Waite copy, but this is not quite so. Most of the major arcana cards are crude copies with occasional changes, such as the substitution of a mermaid on the Magician card (above). Substitutions that, for the most part, don't work all that well. The Magician has a firm grasp of the Sun & Moon but floats in the water, without any solid grounding here on earth. Having established a diagonal Sun/Moon polarity, there is consequently a secondary pairing, between the star & the magical implements on the table, which brings in a lot of unnecessary muddle. One of the muddles is the resemblance of the star to the fabled Star of Bethlehem. Which I cannot recall in any other tarot deck. A similar muddle can be found on the Death card. Here, Death presides over magic mushrooms (which, of course, feed directly on rotting vegetable matter) & flies a flag with the symbol for infinity on it. Infinity is changeless & boring but Death represents change & dread, a contradiction. Mushrooms do not rise from the dead, but feed on it. The book says the mushrooms are poisonous (not psychedelic), a point lost on me as I am not an expert. It also says the background color is red. Looks like orange to me & if so, it would be in the card's favor. Physical death has orange overtones to it, a point that can be made only if you know why it is so. 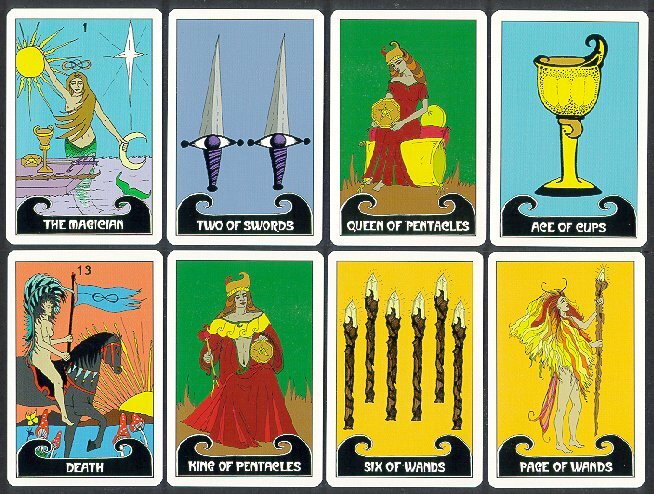 The Rider symbolism ends with the pips in the minor arcana, which is Marseilles-type. All wands have quartz crystals on one end, which is a very particular type of wand, specifically, a magic wand. All Swords appear to have eyes, as if they were seeing "smart swords", made for the US military. Court cards are the usual Page, Knight, Queen & King. All Pages are female. The book is okay. Each of the cards are described. The major arcana gets about 2 pages each, the minors about one. There are a lot of notes about number symbolism & color symbolism. I haven't read the text for every card, but what I have read appears crude. A three is a three is a three is a three, regardless whether a Sword, Wand, Pentacle or Cup. Yellow is yellow is yellow, regardless where or on what card it may turn up. Which means that two-thirds of the notes for the minor arcana cards are repetitive. The brief interpretative notes for each minor card are written as if for the Rider Waite minor cards. Which begs the question why Rider images were not used for them. All in all, a poor showing. I was disappointed.